visited NISSIN WORLD DELICATESSEN on March 5th, 2010. He welcomed by Mr. Suzuki, the President & CEO of Nissin Group and his entire staff. Nissin carries many products from the Kingdom of Thailand. 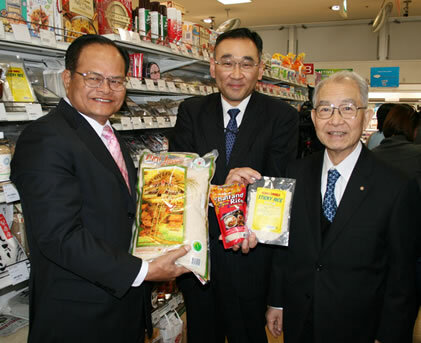 He surprised to see many ham and sausages “Made in Kingdom of Thailand” at Nissin’s own Thai Factory. He very much interested with the meats from all over the world in our “Meat Rush” department. (Hazard Analysis and Critical Control Point) Meat Factory by Thai Government. it very seriously and strictly. Producers and suppliers for export are controlled and educated to meet this standard. “HACCP” plant by the government. Rice from the Kingdom of Thailand is very popular here as well as coconuts milk, green curry, and spices. Thai products are very popular here. Many staff of Embassy in Tokyo visited Nissin with their dignitaries from their country. Group photo taken at the entrance of Nissin with smiling minister. 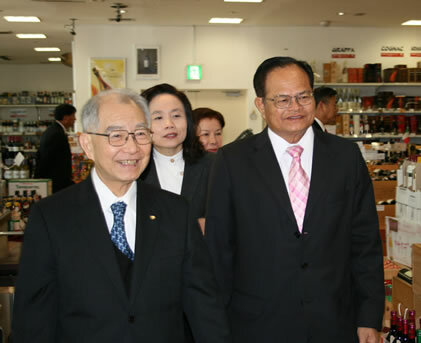 We had a wonderful day with minister Therra Wongsamut and we heartily thanked him for his special visit to NISSIN.